The last time I visited Vegas (in 2009) I had a chance to see “KA” and immediately fell in love with what the Cirque has to offer. This time I had the opportunity to see “O” while in town for the PubCon digital marketing conference. Presented on a spectacular custom stage built in the Bellagio in Las Vegas, “O” was one of the most fantastic and beautiful performances I’ve ever seen. After reading almost 100% positive reviews of this show, I was excited to see this famous Cirque production for myself, and I was not disappointed. 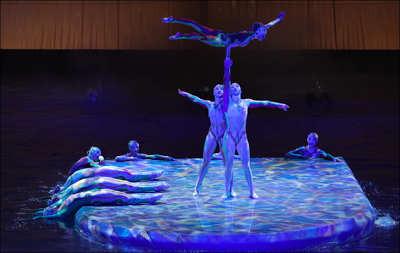 The inspiring acrobatics of the Cirque de Soleil were featured in tandem with a uniquely innovative and equally dazzling moving water stage that produced realistic wild waves during the artistic performance. Watching any Cirque de Soleil performance is like reading a love letter to performance art, and “O” added the element of being a beautiful reminder that all living things are dependent on water. 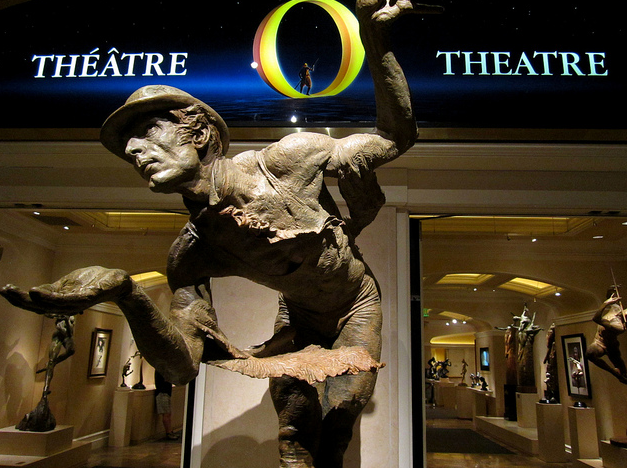 Before I even got into the uniquely designed theater in the Bellagio, I was diverted with the rest of the audience through the Richard MacDonald art gallery, a sculpture gallery that makes up the entryway to the “O” theater, full of MacDonald’s beautiful bronze sculptures of Cirque performers and acrobats. I had never heard of Richard MacDonald before, and none of the reviews I read mentioned the gallery, so I wasn’t expecting to see his amazing bronze statues leaping, dancing, and hanging in space. Inspired by poses from Cirque de Soleil aerialists, acrobats, and clowns alike, some of MacDonald’s pieces seem to defy gravity; his aerialists and acrobats look truly weightless, and the poses look reading to burst into life at a moment’s notice. Though it was an unexpected surprise, the gallery turned out to be a perfect introduction to the show, and somehow managed to get me even more excited to see “O”, one of the best performances in Vegas. The title of the aquatic extravaganza “O” is a play on the French word “eau” pronounced the same way, meaning water. Even when the 1.5 million gallon pool that makes up the stage is not in use, which is almost never, the actors and performers always seem to illustrate the fluidity and freedom of water. Complete with wave effects, special lighting and underwater breathing systems for performers, the water stage is a really impressive feat of engineering and design. The show’s amazing synchronized swimming, underwater acrobatics and other acts were all given a beautiful and original soundtrack by the Cirque’s incredible live music acts, but the musicians were all tucked up and above the stage behind protective barriers, which turned out to be a good thing once water started flying. I was sitting further back in the house so I didn’t get wet, but it looked like the first couple rows got a pretty good splashing to go with their evening’s entertainment. Even without a light soaking, “O” left me awed at what the human body can do, and what a dramatic and beautiful part life giving water can play in all that.